Need your phone & keys out of your pocket for running? This arm band protects phones from rain & has a zippered pocket for keys. Click add to cart now to remove your last excuse not to run which phones fit? - IPhone 7 plus, - iPhone 6s plus - Samsung galaxy note 5 - Samsung galaxy note 4 - Samsung galaxy s7 edge - galaxy s8 plus - google pixel xl - moto z - HTC u11 - zte axon 7 - one plus 5 - one plus 3 - one plus 2 - Huawei nexus 6p - Sony xperia xz premium - Motorola droid turbo 2 - nexus 6 - meizu mx4 pro - xiaomi mi note 2 - xiaomi Redmi note 4 - xiaomi mi mix 2 - Motorola moto z2 play - nokia 8 - other similar android phones pocket size is 6.25"x3.10"x0.30" if your phone doesn't fit, we'll refund you hassle free. What size should I get? Small: 5" to 11" forearm circumference. Large: 8" to 16" forearm circumference. Measure in the middle of your forearm, 5" or so down from your elbow. Scroll up to the size chart in the main photo section for full details. Can I plug in headphones? Yes. There's a small hole to feed headphones into the case. Crank your tunes, podcasts, and answer calls . ✔ THE ONLY 3 IN 1 ARMBAND ON THE MARKET: 1. 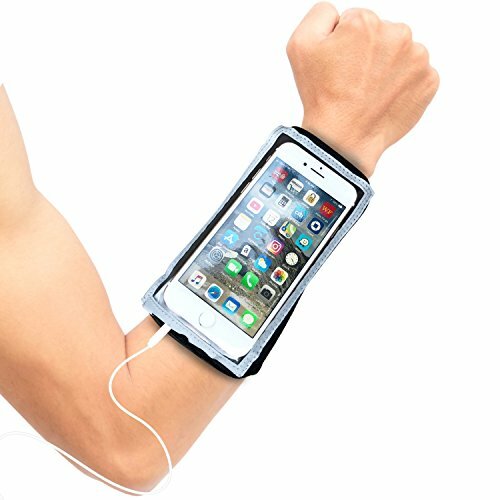 Phone forearm armband, 2. Wallet 3. Sweatband. If you have any questions about this product by MyBand, contact us by completing and submitting the form below. If you are looking for a specif part number, please include it with your message.